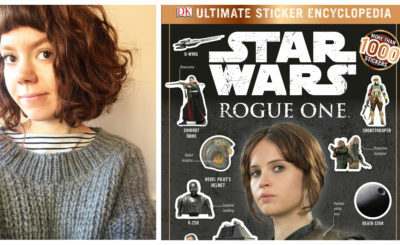 Tricia Barr is the author or two Star Wars reference books – Ultimate Star Wars and Star Wars Visual Encyclopedia – as well as the award-winning space opera/fantasy novel Wynde. She’s a regular contributor to Star Wars Insider, created the website FANgirl Blog, and co-hosts the Fangirls Going Rogue and Hyperspace Theories podcasts. 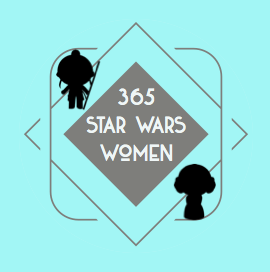 Tricia was kind enough to answer a few questions for 365 Days of Star Wars Women via email for this interview. When did you become a Star Wars fan? 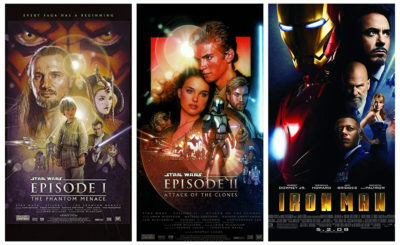 I was a Star Wars fan when there was just a movie called “Star Wars” and not a whole franchise. I was 8. It was 1977. We waited in line at the military base theater. Love the memories, but don’t miss waiting in lines. Who are your favorite Star Wars women? Leia was my first heroine. She owned everything she did and had confidence, and that resonated with me. I cosplayed her for Halloween 1977. I loved Han and Leia together, too. Some people think ‘shipping is only about romance, but it’s really about rooting for the characters to be happy. Han completed Leia in a way that felt organic and true. Jaina Solo action figure. Photo by @Geek_Kay . 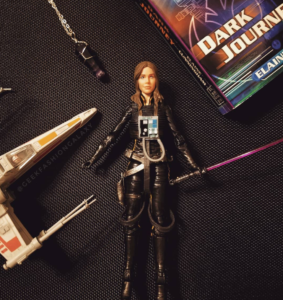 When Jaina Solo came along – daughter of Han Solo and Leia Organa in the Expanded Universe – she spoke to that fangirl in me that had been waiting for Leia to pick up a lightsaber. Jaina took over Luke Skywalker’s X-wing squadron, Twin Suns. She had a purple lightsaber and dated her father’s archrival’s son, Jag Fel, all while going through a Heroine’s Journey in the New Jedi Order book series. I see a lot of Jaina in Rey – Jaina scavenged an extra-galactic alien invader’s spaceship – which is probably why I like Rey too. Something from Jaina’s adventures that we still haven’t seen with Rey is that Jaina had female friends, especially Tenel Ka and Tahiri, and a female mentor in Mara Jade Skywalker. The New Jedi Order had all types of female characters like scientist Danni Quee, intelligence operative Iella Wessiri Antilles, who also had to balance motherhood and a husband, and pilot/Force-sensitive Tyria Sarkin Tainer. When did you start writing about Star Wars? Was there a specific event that inspired you to start writing about Star Wars? When my high school English teacher asked for a two-page report on symbolism in The Catcher in the Rye, I turned in a four-page report because I’ve always loved diving into the nuts and bolts of storytelling. My real deep dive into Star Wars came when I started writing fanfic. I’m also a nationally ranked equestrian, and one thing I’ve learned over the years is that there is no substitute for putting in the hard work. I scoured books for continuity and lore, read interviews with authors, and debated characterization in message forums. Looking back on the fanfic days, it stemmed from a compulsion to fix where I thought the Expanded Universe was going wrong, particularly with female characters. Everything I did for fanfic paid off when I started writing professionally. Can you explain/share stories about how and why you started the FANgirl blog and the Fangirls Going Rogue podcast? Being a Star Wars fangirl ten to fifteen years ago also meant you’d experience bullying. Back then I had opinions on Jaina’s story in particular. Her Heroine’s Journey stalled after Destiny’s Way, just past the mid-point of the New Jedi Order series. I was frustrated by the repetition of harmful gendered tropes. Women who talked about storytelling were silenced, shamed, and bullied on message boards. Social media and blogs were taking off on the path to becoming the new age of the internet fandom. That’s when I realized I didn’t need message boards to talk about Star Wars. FANgirl Blog gave me an opportunity to not only express my thoughts, but also provide a venue to allow other female fans to flourish. I’m so proud of the many women who started at my site and are now writing for big name sites. That was the goal, to do it not just for me but for those that followed. Starting the blog was the best decision because blogging in long form proved that I knew my Star Wars. Because of my constructive criticism and passion, Del Rey Star Wars invited me to write for their site, which led to Star Wars Insider assignments. I can still remember the day Frank Parisi, then editor at Del Rey, emailed to ask if I wanted to interview Aaron Allston for Insider. I was riding my horse, checked my emails, and nearly fell off. Fangirls Going Rogue podcast evolved from Her Universe’s Year of the Fangirl. Teresa Delgado and I met through that initiative. We did a podcast, Fangirl Chat, during Celebration Europe when they announced Star Wars Rebels. From there, RebelForce Radio brought us on board as a show in their network from the female perspective; by the time their network dissolved we had a big enough platform to pivot Fangirls Going Rogue into an independent, self-reliant podcast and website. Sarah Woloski, our third member, we met through Year of the Fangirl, as well. The show had such a passionate following that Sandra Choute came on to manage the social media. One of our goals was to highlight women and minorities working professionally or participating from a fandom side. What are your favorite things you have written for the official Star Wars site and Star Wars Insider? The favorite piece I wrote for StarWars.com was my first article. You have to love all your work, but it was a unique pitch that I made on a dial-up internet connection from the Galapagos Islands where I was going to celebrate May the Fourth. Throughout the whole trip I wore Star Wars attire as a way to start a conversation with my fellow travelers. I pitched the idea of telling the story of my adventures. It was really different than most of the content the site was posting at that time, but they accepted the piece. I’ve loved writing for Star Wars Insider because you can get more into storytelling and analysis. Recently I have been primarily writing pieces on the Hero’s Journey, breaking down the Campbellian model and showing how modern takes by Christopher Vogler (The Writer’s Journey) and Maureen Murdock (The Heroine’s Journey) are changing myth. I was chomping at the bit to do the Rey pieces (Issues #167 and #168) after The Force Awakens, so when the approvals came down those were fun to tackle. My favorite though was the “Fangirls Flying High” article that I wrote for Issue #151 in 2014. It was a piece specifically commissioned to acknowledge the women who were fans, all the way back to 1977. 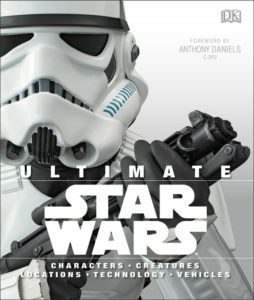 How did you become an author for Ultimate Star Wars and the Star Wars Visual Encyclopedia? What was that experience like? I wasn’t actively putting my name in the hat to write a Star Wars book when I was approached to do Ultimate Star Wars, but I had some experience doing edits on The Essential Reader’s Companion that helped show I had a nuanced understanding of the broader lore. Ultimate Star Wars was on an incredibly tight timeline, and we were tasked with establishing everything in canon at the point where they were coming into the new films. Initially there is excitement – or as we call it on Fangirls Going Rogue, fangirl flailing – then you are in the weeds writing for two months at the pace you’d write a term paper for just one night. The exhaustion and sheer terror that took over some nights was worth the launch party at Celebration Anaheim with Anthony Daniels. The Star Wars Visual Encyclopedia was easier. I knew how the publishing process worked and had a system for writing against the deadlines. Still, that book was something different than what we’ve typically seen. Adam Bray, Cole Horton, and I kicked off that book’s writing with a pie party in the DK Publishing office in London before Celebration Europe. DK pulled so many images and their team kept massaging that book until it looked amazing. I feel like my experience managing my own multi-million dollar engineering projects helps me understand what the publisher and the franchise expect. Having an excellent day job has afforded me the ability to write these books. On both books I had a female editor: Sadie Smith on Ultimate Star Wars and Ruth Amos on Star Wars Visual Encyclopedia. What are your thoughts about Star Wars having no female writers for the feature films (besides Leigh Brackett who wrote the first draft for The Empire Strikes Back) and few female writers for the TV series so far? Not just no female writers on the films, but women haven’t been given a chance to write the junior or adult novelizations, either. Star Wars from its inception was a story about oppression – it was conceived in a time of social upheaval. Everyone acknowledges that Leia was a breakout female character, and if you look at The Phantom Menace I think Padmé and the Handmaidens were, too. But they both fell prey to tropes. Lucas was truly struggling against the system and telling a personal story about his relationship with his father. If you want to keep Star Wars a story about the underdogs and oppression, then the underdogs need to tell those stories. 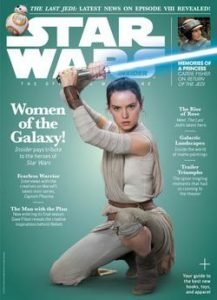 “The Women of Star Wars” by Tricia Barr from Star Wars Insider #176. When Kathleen Kennedy came on to do Star Wars, I felt like George Lucas knew he needed a woman to take the reins or the franchise would quickly devolve into simply a fanboy wish-fulfillment vessel. 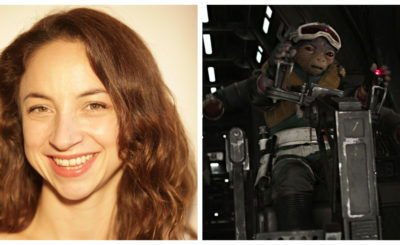 Kennedy has spent a professional lifetime supporting male storytellers; she even admitted that when she first started working at Lucasfilm she was looking up “strong female character.” She was on a learning curve, and the female hires in the Story Group were meant to bolster the voices in the room on that topic. Kennedy also has engaged in the double-speak that is common in Hollywood when questioned on the lack of diversity in her director and screenwriter hires. One of her points has been risk-taking or building women up to be successful. She could have made that happen through the animation, but the gender imbalance is as bad there. Unfortunately it’s going to take a firm commitment to inclusivity goals to change the culture within a corporation that has a longstanding pattern of diminishing women’s place at the table. Marcia Lucas was written out of her role in making Star Wars a hit, Carrie Fisher had her own #MeToo moment, and Natalie Portman has been derided from inside the franchise simply for being an opinionated woman. All these things happened under George Lucas’ watch, and I don’t believe Lucasfilm has really acknowledged the problems that existed in their corporate culture from before the Disney purchase. You can look at Rey’s role in The Last Jedi, where she spent the last act mostly out of the story, and wonder if the same pattern of failing the female character in the trilogy is happening again. I have no doubt that with a woman in the mix – think Hunger Games or Wonder Woman – Jyn’s and Rey’s stories would be different. That’s not saying that their stories aren’t good, but I believe they could be so much better and relative to women. It’s not just the writers and directors, but how they perpetuate the problem by hiring men who look and think like them. The Art Of books for the new movies rarely mention Story Group members, but discuss a lot of men who had a seat at the table. When it comes to the films, the brain trust is hardly talked about, and I believe that’s because it is so male and white. They are the people making the high-level decisions on the myth: J.J Abrams, Lawrence Kasdan, Michael Arndt, Rian Johnson, Simon Kinberg, and Rick Carter. The Story Group provides the connectivity, but they aren’t where the creative control rests. Hard data from scholarly research proves that having women in writing and directing roles changes the storytelling in front of the camera and the people working behind the camera at all levels. You can’t really tell a story where the intention is to say “anyone can be a hero” when the meta of the story creation process doesn’t give women or people of color a chance to be the hero of the storytelling process. Do you have any Star Wars dream projects you’d like to work on? Related: any female characters you’d be the most excited to write for? I’d love to see a Heroine’s Journey book for Rey, once her sequel trilogy arc is done. Sort of a Making Of meets character’s impact on myth. I was watching the season premiere of The 100, which has so many layered female characters, and I could see homages to the new Star Wars films. It would be fun to make a glorious coffee table book about Rey’s influence. Although I have written non-fiction, I am an award-winning science fiction novelist. On the fiction side, I want to write about Padmé and Naboo. When I started on Ultimate Star Wars I was surprised that the Handmaidens from the films were omitted in favor of some really minor characters from the animation. The list of characters came from the Story Group, which again highlights where there is room for improvement. I don’t believe that is a misogynistic omission but rather no one is in the room going “but what about these characters?” (And yes, plenty of people love the prequels!) I hope, too, that one day Star Wars mines the alternate universe potential it has, and when that happens I want to write the novel about Jaina Solo completing her Heroine’s Journey. Has Star Wars inspired your own storytelling? Yes! 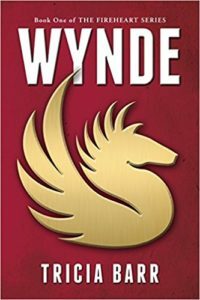 My novel Wynde is a space opera about a female pilot Vespa, who has parents that are in the global spotlight. The story opens with a Pearl Harbor-style attack perpetrated by an alien race, and the heroine must make an impossible choice, then face the consequences as war erupts between two worlds. It’s absolutely inspired by my love of Jaina Solo and her story. One of the lessons I’ve learned from studying Star Wars is that the world-building can impact the inclusion so I worked hard on that upfront. I wrote what I loved to talk about, and I’m continuing on growing that universe with a sequel that’s in the works. You can find Tricia on Twitter @fangirlcantina. You can find out more about Tricia on her website, FANGirl blog, and at Fangirls Going Rogue.